Thank you for this link !!! Brilliant guys !! Sounds there has been lots of works !!! It just looks so much better ... and Westhill is already wonderful ! Our plan is to do a small presentation in August. We want to write a little about the shadows and lighting and do some high resolution shots to illustrate. Anyway, to thank you for being so patient, here's another medium resolution Westhill shot from a different angle in that same weather. The new lighting system and shadows looks so good, I just can't wait to try it! Thank you! Quote from Scawen : Our plan is to do a small presentation in August. We want to write a little about the shadows and lighting and do some high resolution shots to illustrate. These roads look bloody amazing! These shots are quite an evolution and made me question if it could eventually lead to adjustable hour of the day (or night). Either way it's great, thanks for sharing Scawen! Quote from Skytrill : These shots are quite an evolution and made me question if it could eventually lead to adjustable hour of the day (or night). Either way it's great, thanks for sharing Scawen! It's a start. Dynamic shadows and ambient lighting are steps in this direction. Then it needs at least procedural sky and clouds, and after that, it would need to support spotlights on tracks and cars. And all of these can be long to develop if you want it to be fast, stable and nice looking. Hm...That is not even best shot yet! It's obviously a fact. Nice to see some news about the graphical overhaul, I bet on Eric being motivated again and working harder on LFS when he see how good his work is rendred now ingame. So now we have diffuse and glossy material, specular map and real time shadows ? is there any plan introducing normal maps into the game or some sorte of layering through RGB mask or similar technique for more varied textures ? And one last stupid question : is developing/improving graphic engine more rewarding than physics coding ? well take a look in misc addons. then you will know . no my game is not screwed up. but this was form one of the mods i am building. but graphics should still not do that. and it is a legal mod aswell. and scawen knows about me doing them , so not sure why you come at me as you do. my game isnt screwed up. i also got a working vanilla lfs. no toppings though.besides i also wrote all this takes to fix is a simple restart of LFS. Am I seeing reflections with a fresnel effect on this post? i think you might be right Nacim. in the night mod there is already reflection on this file /post /pole. so is highly likely itll be more in update.are you using your own shaders nacim? because the left image in your post does not look like my game. the right one does infact. so was thinking if you use your own you may not see that effect proper maybe? nice comparison. but pussles me a bit why you didnt just upload the pic here instead of a link ? could have wished to see a little more of the old one. but very nice. 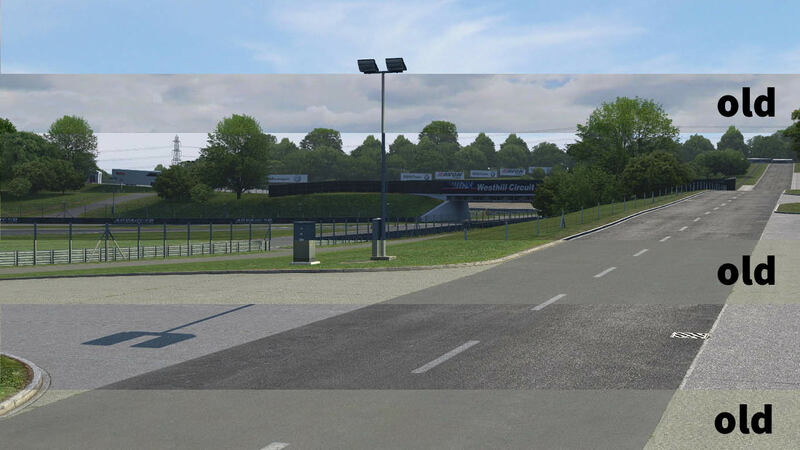 Quote from Scawen : That corner now has 3D kerbs. Attached screenshot at resolution 1600x900. Last edited by THE WIZARD DK, Tue, 24 Jul 2018 10:34 . Looks really awesome, and brings LFS to 2010 decade. Will be interesting to see the reaction on sim racing forums around. Personally I'm fine also with current graphics even my PC can handle also heavier stuff. What I love more is those possible nice little fixes in the tracks as you described the one curb at Westhill. I can't be silent about Fern Bay, currently there are just so much curves and curbs that can be cut jumping over the grass. I deeply wish the update will bring new curbs to Fern Bay and make it a track that is meant to drive inside track lines to reach best lap times. Quote from lucaf : I deeply wish the update will bring new curbs to Fern Bay and make it a track that is meant to drive inside track lines to reach best lap times. I don't want to drive this topic off-topic, but that thing about FE. As much as I (personally) like it, we all know what it's like right now and would definitely need some improvements. Last week, when we raced on Fern Bay (182nd RTFR), I thought exactly the same as lucaf here (highlighted in bold). It's really a pity there are many corners where we cross the white line - not with 2 wheels, but like with the width of 2-3 cars (for example the turn near the beach and the start/finish straight of Green). It would be so much challenging to restrict the racing area this way (would probably need a Fern Bay PB- and WR-wipe on LFSW). Maybe this calls for a FE remake, which is not really a priority right now, and that's of course acceptable. Just wanted to mention that I completely agree with the point of lucaf. Looking forward to the teasers, I really like what I see on the last two screenshots with the new graphics, great job! guys. when devs say graphical update. my initial thought is. fernbay inclusive. i also think devs have fernbay in a special place as it was the or one of the first tracks ever in lfs. i think you should not worry. because fernbay will be included in this update aswell as SO and i think aston gets a makeover too as aston is not many files and would be an easy track for super Eric to update i think you should worry not. im sure devs are perfectly aware of what users would like to see . just saying as i see all these wishes and things. that is why we got the suggestion threads right. and devs do read them. patience and worry not . devs got this im sure! EDIT: i too was driving FE y-day. thinking abnout the curbs. mostly because i changed all of them to another look.but came to think. this and this curb could really use a makeover. so im a +1 . but devs got this. Last edited by THE WIZARD DK, Tue, 24 Jul 2018 10:41 . Like it or not I have to be patient because I do not like physics in any other game.But I'll be completely honest,the progress on the new tyres physics is painfully slow. Quote from THE WIZARD DK : nice comparison. but pussles me a bit why you didnt just upload the pic here instead of a link ? could have wished to see a little more of the old one. but very nice. You can move the white slider between old/new image. How hard would these be? It is suggested way before several times, with several purposes. And I will always give +1 regardless of any. Limited fuel load. Also suggested before and also giving +1 regardless of any. Quote from UnknownMaster21 : It is suggested way before several times, with several purposes. And I will always give +1 regardless of any. Quote from Gutholz : You can move the white slider between old/new image. oh. i didnt notice that. thank you and good word again to flame. dont get me wrong on this. but everyone wants to get noticed. and with i think around 300.000 users. that pretty much impossible for devs to get into all. my own thought is devs take what they think could be useful to LFS and/or community. which goes by their vision. so they do listen to the community but also have their own vision. hope it helped a bit to better understand why forums is diveded into these sections. .
Last edited by THE WIZARD DK, Tue, 24 Jul 2018 15:14 . (THE WIZARD DK) DELETED by THE WIZARD DK : quote was supposed to be in other post and this was a double post. ...but still... I believe, this is how devs would act right now!